← Do You Know Why Your Plants May Be Wilting? If you’re a dog owner, you likely feel that your pet is an official member of the family. That said, just like children, dogs can also misbehave at times. When dogs misbehave in your yard, you may need to take some extra measures to protect your landscaping. So what kind of havoc can dogs cause in your yard? It’s hard to get upset with dogs, because they really are just eager explorers at heart. That said, what can you do to help prevent them from getting carried away? Dogs have a natural instinct to patrol the perimeter of the yard…so you can make a running area near the edge of your yard. Plus, leading to this area, you can make a clear path that they will be motivated to use. 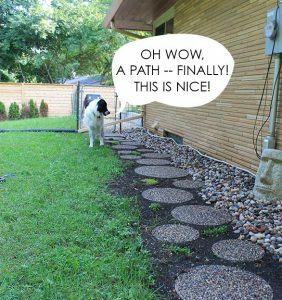 If your dog has already tracked a path, but you want to veer them away from using that path…try to retain them by making a new path. It is a great idea to use materials like stones, gravel, bark, as well as concrete and brick. You can also be creative in finding a way to block off their other route, in hopes that they get used to the new one. Dogs don’t realize the difference between natural weeded areas and your garden, but you can incorporate other ways of keeping them away from these areas. You can use fences, large pieces of wood, chicken wire, landscaping ornaments, or other barriers. You may also want to inquire about non-toxic organic sprays that will be safe for your plants to discourage biting. These products will of course be safe for your pets too! As you know, dogs love to dig. Some breeds more than others of course. 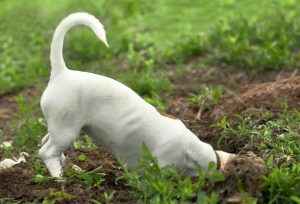 Sometimes they are digging to bury a bone or other random object. Sometimes they are seeking a cooler place to hang out. Sometimes they just do it for fun as a way of occupying their time. 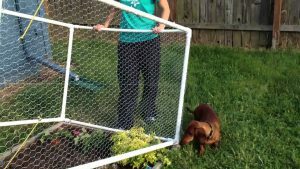 To prevent dogs from trying to escape a certain area, you can add boards or chicken wire below the soil line. If they are disrupting parts of the garden, you can try laying chicken wire down or installing wooden stakes upright just below or at the soil level. This gets in the way of their digging, so then they are likely to get bored and go find another area. It is also a good idea to make a designated area with sand or gravel for your dog – kind of like a sandbox for a child, in hopes that they get used to that area as their own special spot. Encourage them to use that area by loading it up with toys and guiding them back to that area when you want to play with them. It may even be a great idea to set up a dog house here. 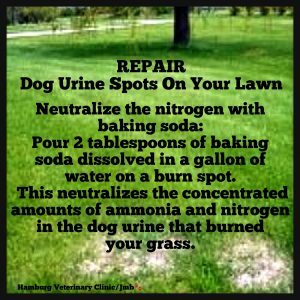 Unfortunately, when dogs urinate, it results in brown spots on your grass due to the nitrogen in their urine. There are products that you can buy to help lessen or even prevent this “burn” from happening. You also want to keep your lawn well-hydrated to dilute the urine and keep the blades of grass a bit longer to help hide these areas. If you pay attention to these four main things, you will have less stress when it comes to how your dog interacts with your landscaping. 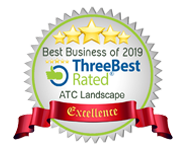 If you are looking for a professional landscaping company in the Coquitlam area, give ATC Landscape a call today! This entry was posted in Landscaping Tips and tagged dog paths in yard, dogs and landscaping, dogs interfering with landscaping, prevent dogs digging holes, prevent urine stains in grass, protect landscaping from dogs, protect landscaping from pets, protect plants from dogs, treat urine stains in grass. Bookmark the permalink.